Clean Bandit announce their new album ‘What Is Love?’ out November 30! Global hitmakers Clean Bandit are delighted to announce details of their second studio album ‘What Is Love?’, confirmed for release on 30th November 2018. The LP is available to preorder now. The album – underpinned by the band’ hit singles “Rockabye” feat. Anne-Marie and Sean Paul, “Symphony” feat. Zara Larsson, “I Miss You” feat. Julia Michaels, “Tears” feat. Louisa Johnson and “Solo” feat. Demi Lovato [all available as instant grats with each deluxe album preorder] – was recorded across the globe and has been produced by the trio’s long-standing producer, Mark Ralph (Years & Years), alongside Clean Bandit’s very own, 2 x Ivor Novello-winning, Jack Patterson, and Grace Chatto. Breaking through to the mainstream in 2014 with their mammoth 12 million-selling and GRAMMY-winning single “Rather Be”, the pioneering 6 x BRIT-nominated trio have paved the way in the global pop scene with their matchless blend of classical, electronica, pop, dancehall and R&B, proving themselves as a force to be reckoned with in the charts across the globe. 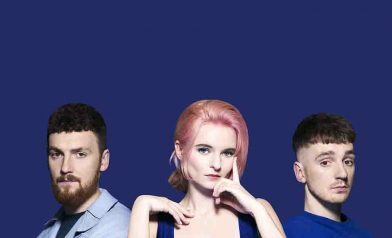 One of the most successful and in-demand collectives of the century, Clean Bandit have sold over 40 million singles worldwide and accumulated over 10 billion streams and 3.5 billion YouTube views to date! Not to mention their cutting-edge self-directed official music videos that have further propelled the band as an unparalleled creative force. In their native UK, “Solo” feat. Demi Lovato [the band’s latest single] not only marked Clean Bandit’s fourth UK No.1, but their ninth UK Top 5 and seventh consecutive UK Top 5 that saw them land the most consecutive Top 5 records, from any artist, since Girls Aloud in 2005 and the same amount of UK No.1’s as Justin Timberlake, One Direction and Lady Gaga. The trio’s 2016 UK Christmas No.1 “Rockabye” continues to hold the record as the longest-running UK No.1 in 24 years for a UK band, surpassing Wet Wet Wet’s “Love Is All Around”. Clean Bandit is: Jack Patterson, Grace Chatto and Luke Patterson.